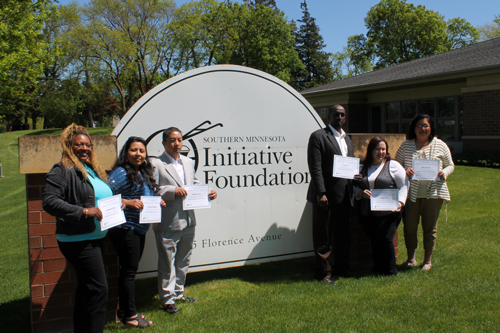 OWATONNA, Minn., May 19, 2016 – After launching The Prosperity Initiative at the end of 2015, Southern Minnesota Initiative Foundation (SMIF) congratulates the first six business owners on completing the program’s executive training curriculum. The Prosperity Initiative, a program intended to promote minority-owned business growth in southern Minnesota, is funded in part by Minnesota’s Department of Employment and Economic Development (DEED). The Prosperity Initiative kicked-off with a conference in March 2016. 29 minority owned-businesses and 31 small business service providers and partners attended. The goal of the conference was to let business owners know about available resources, from legal to marketing assistance. Six businesses at the conference were selected via a competitive application process to participate in an intensive business training, which took place May 16-17 at SMIF’s offices. During the 2-day training, the business owners assessed their company’s performance, discussed their personal strengths, gained technical business knowledge and set goals for future growth. The next step will be for minority business owners and mentors to convene on Aug 5th to get acquainted and begin their work together; SMIF is currently seeking mentors to assist companies in growing and succeeding over the next 6-9 months of mentorship, technical assistance and further training. Please contact Meg Steuer (megs@smifoundation.org) if interested. SMIF will continue to work with key program partners to host a second training round later in 2016. The Prosperity Initiative curriculum is guided by a regional survey of minority-owned business conducted in 2015. Key findings from this survey indicated that only 13% of respondents received bank loans and 68% felt a lack of support or mentorship in moving their business to the next level. Common barriers for minority-owned businesses, according to the survey, included high-interest loans, overall lack of financial support, little knowledge of business resources and the lack of general business knowledge. The full report is available on SMIF’s website: http://smifoundation.org/econ_development/ed_programs/the-prosperity-initiative.html. In addition to Small Business Development Center-Rochester, other partner organizations include: Greater Mankato Diversity Council, Latino Economic Development Center (Minneapolis), Project FINE (Winona), Region 9 Development Commission (Mankato), Blandin Foundation’s Leadership in Ethnically Diverse Communities Program, Community and Economic Development Associates, Minnesota Procurement Technical Assistance Center, Diversity Council (Rochester), Rochester Chamber of Commerce, African Development Center (Minneapolis), LegalCORPS, Regional Center for Entrepreneurial Facilitation (Mankato) and Welcome Center (Austin). If you have any questions regarding the Prosperity Initiative, please contact Meg Steuer at MegS@smifoundation.org or 608-397-0079.